To run an effective business you need to have the knowledge and skills related to managing the business and leading people. You need to have the technical competency to handle job tasks and relational competency to serve people. To run a godly business, one that is established within the will of God, you need to be open and receptive to God's voice and respond properly and timely to God when He calls, directs, guides, speaks or responds to your prayer. Your ability to respond to God is called spirituality or spiritual competency. In order to run any form of business with a high probability of success, however, you need an entrepreneurial spirit on top of technical competency, relational competency and spiritual competency. This entrepreneurial spirit represents your will to stand up after substantial mistakes or losses, your determination to move forward when everything goes wrong, and your spirit to make a breakthrough when insurmountable hurdles block your path. This entrepreneurial spirit is something that is embedded in your DNA. You might learn knowledge and skills, and might be able to enhance your spirituality with God through devotion times, but it is incredibly difficult for someone who does not possess this entrepreneurial spirit to learn or acquire. It is ideal that an entrepreneur has been born with this entrepreneurial spirit, which has been deeply rooted to your spirituality with God and cultivated richly with knowledge and skills based on your resilient efforts. With this entrepreneurial spirit deeply rooted to your spirituality with God, then the Lord will bless you with His divine strength, and you will remain strong even in the midst of challenges, which may be seemingly hopeless. Your wings will soar like eagles; you may run, but will not go weary; and you may walk, but not grow faint. In summary, it is God's blessing! 1. 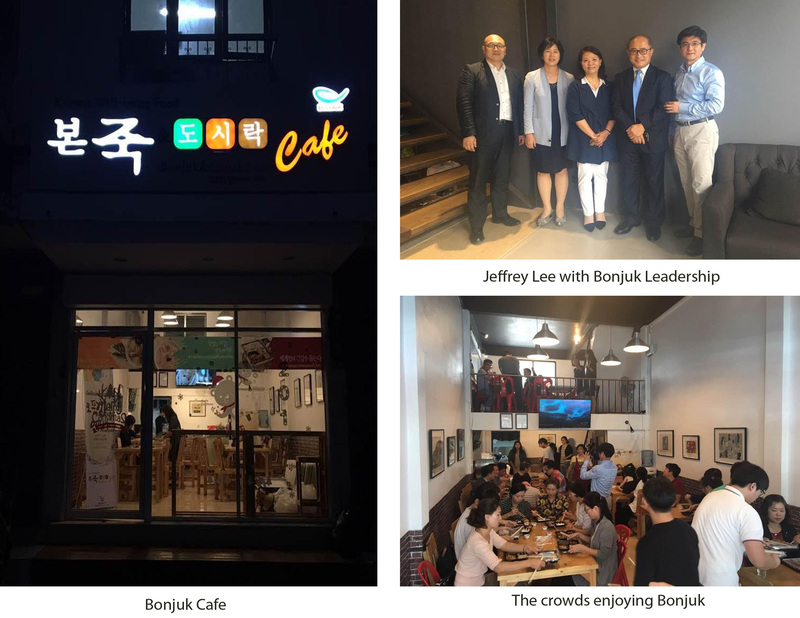 Skybay Thailand, the implementing member of SfK Ministries in Thailand, helped open the first mission outlet of Bonjuk Cafe on the ground floor of its building in Bangkok. Bonjuk is a well known health food franchise in South Korea with over 1,500 business outlets around the world. Its founders and owners are Christians and they consider this business a Kingdom Business. A missionary couple contacted the Bonjuk Head Office, but the opening became a reality under Skybay Thailand's business incubation center within three months! Following the dedication service to the Lord on December 29, 2016, Jeffrey and Peter, CEO of Skybay Thailand, met with the leadership team of Bonjuk and reached an agreement in principle for collaboration in expanding the Bonjuk franchise in the developing nations. We look forward to witnessing what the Lord has in store for His Kingdom and His own glory through this collaboration. 2. Skybay Thailand has a couple of other franchise opportunities under development. These opportunities will help solidify the foundation of Skybay Thailand. It has also won a contract from Korea Tourism Organization, a Korea's government agency, in Bangkok to handle its advertising and business promotion activities. It is a wonderful opportunity to expand Skybay's existing line of business to diversity its business mix. 3. Jeffrey Lee lectured about BAM at the annual retreat of Korean Missionary Association in Thailand on December 20 in Pattaya, Thailand. Approximately 300 people attended this retreat and many indicated their conviction about the need for BAM in the mission field after the lecture. Praise the Lord! 4. SfK Asia, the intended entity for SfK ministries in Asia, has faced some challenges from a regulatory standpoint. SfK is actively exploring a few options for this purpose and the outcome will soon materialize. Please pray with us for God's blessing with His divine wisdom and also pray for us to seek His wisdom. 5. SfK Korea is progressing well. We will soon establish SfK Korea and the presentation material for the first SfK BAM Fund will be ready for distribution in January 2017. Dr. Wonmin Sohn, COO for SfK Korea, is working diligently to get this project moving forward. 6. SfK Life's IT Team completed the development of the first database designed for Kingdom Fellows. The UAT has been completed and the team will now focus on developing the database for Missional Businesses. Please pray that the team will make a concerted effort towards this goal. Feb. 18-Mar. 10, 2017: BAM Training Course will take place in Chiang Mai. This course will provide two weeks of classroom training and one week of site visitation. If you are serious about BAM, please register at http://bamtraining.org/bam-course/ . Mar. 7-11, 2017: Wealth Creation for Holistic Transformation Consultation - Lausanne Movement and BAM Global Think Tank will co-host this important consultation in Chiang Mai. Jeffrey will participate in two groups out of seven groups: Wealth Creation and the Poor and Wealth Creation and the Church. Mar. 25, 2017: Skybay Thailand, in cooperation with TMC (Thai Miracle Community), Skybay Thailand's sister ministry, will hold its second anniversary celebration in Bangkok, Thailand. Several musicians from Korea will hold a concert for Thai nationals and all stakeholders involved with Skybay Thailand. Mar. 27-28, 2017: Missional Business Seminar in Bangkok, Thailand. This seminar will be provided for businesses under incubation at Skybay Thailand and potential missional entrepreneurs. Apr. 3-7, 2017: Mini SfK MBA (Missional Business Academy) in Kigali, Rwanda. This mini version of MBA will be provided for the members of Nanuri Ltd and other missionaries interested in BAM. May 8-19, 2017: World Mission University, Los Angeles, CA will offer a 40-hour intensive class on Theories and Practices of BAM. This class will be open to all undergraduate and graduate students at the university, as well as the general public. If you are interested, please send your e-mail to info@sfklife.org for additional information. God may show us the most optimal way to establish SfK Asia to support ministries in supporting missional businesses in Asia. We may gain God's favor in establishing SfK Korea and SfK BAM Fund I.
Skybay Thailand may stabilize and grow to be an exemplary model for the implementing member. IT team's efforts may bear fruits in developing and expanding SfK's database platforms. Kristin and I may receive the most appropriate form of visa from the Thailand government and our settlement process may go smoothly. Thank you very much for standing with us and supporting SfK Ministries with prayer and monetary funds. May God bless you richly until the next Newsletter. Joyfully in service for the Lord!! !